The most vital word in the twenty-third Psalm is the fourth. The Lord is MY Shepherd. I know a young mother. She was teaching a tiny toddler the twenty-third Psalm. “Now say this after me,” she said. “The Lord is my Shepherd.” “The Lord is your Shepherd, ” the baby lips replied. “No, no! 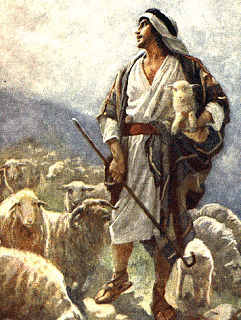 Not your Shepherd, but my Shepherd!” “That’s what I said, Mum; the Lord is your Shepherd.” And the poor young mother had to give it up for that night, feeling crestfallen and disappointed. I knew a padre – the Rev. J. A. Gault, O.B.E. – who did a wonderful work in France during the First World War. It was his custom, when men were going into the firing-line, to get them to repeat with him the opening clause of the Shepherd Psalm, ticking it off on the fingers of their left hands. The little finger represented the word The, the next finger Lord, the middle finger Is, the index finger My, and the thumb Shepherd. He called it his Five-finger Exercise. Every man was asked to mark the palm of his hand with indelible pencil to remind him of the text, and special stress was laid on the index finger – my Shepherd – the finger that spoke of the personal appropriation of the shepherdly care. After the battle of Bullecourt, one of Mr. Gault’s young fellows was found, quite dead, grasping firmly with his right hand the index finger of his left. “Don’t say your, say my! pleaded the puzzled mother. But the tiny tot did not understand. But Mr. Gault’s young soldier understood. And, with an innumerable host of saints and heros and martyrs, he rejoiced that he had a place peculiarly his own in the heart of the Good Shepherd, and clung to that sweet faith in perfect serenity to the last. And so may you.